The dimensional difference between heavy gauge thermoforming (sometimes referred to as thick gauge or sheet fed thermoforming ) and thin gauge (also referred to as roll fed) thermoforming may only start as a few tenths of an inch in part thickness, but the manufacturing techniques, machinery required, and scope of applications that the two are best suited for are quite distinct from one another. Additionally, because the machinery required is unique for each process category, most plastic thermoforming manufacturers specialize in only one or the other. For instance, Productive Plastics is a custom heavy gauge plastic thermoforming manufacturer. So, you can save some time when searching for a processor if you know which category of thermoforming is the right solution for your application. 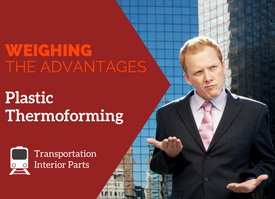 Does your application favor heavy gauge thermoforming? 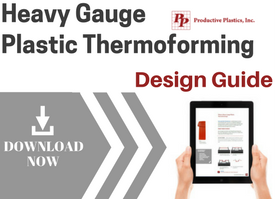 If so, contact us or download our Heavy Gauge Plastic Thermoforming Design Guide for more detailed information on the features and benefits of plastic thermoforming and to explore how Productive Plastics can provide manufacturing solutions for your product. Help us spread some holiday cheer by sharing your input on what plastic thermoforming and manufacturing content you find valuable. Take this 2 minute survey and we will donate $5 to the Lifesong for Orphans organization. We appreciate your time and input. Happy Holidays! The heavy gauge plastic thermoforming process can produce a very versatile range of highly detailed, durable, and tight tolerance parts with almost limitless design possibilities. The process is fast, cost effective, and ideally suited for a large list of markets and applications. However, like all manufacturing processes, plastic thermoforming requires technical expertise, detailed operating procedures, engineered tooling design and construction, and a comprehensive quality management system to ensure the consistent production of the most cost-effective solutions at the desired level of quality. 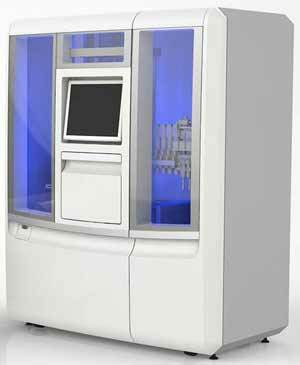 As such, not every plastic thermoforming processor is equally capable. Contract manufacturers with poor tooling, processing and quality controls can end up delaying your project or OEM product and increase costs. Productive Plastics recommends asking the following questions to gauge if a custom plastic manufacturer will be able to consistently produce parts at your required level of quality and dimension tolerances. 1. Does the manufacturer have an accredited quality control program? Ensuring that your manufacturer has adopted an accredited quality control program, such as ISO 9001, will indicate that the company has an active quality control process in place that has been evaluated and certified by an industry recognized third party. The accreditation documentation, often available on the manufacturer’s website, will give you detailed information on what aspects of the company have been certified and supporting quality documentation can often be requested from the processor. 2. Is the manufacturer’s facility organized and clean? This may seem like a trivial point, but it can be a key indicator to a company’s commitment to quality. A company with a well-organized manufacturing floor is much more likely to take quality, efficiency, process improvement, and safety seriously. If you are not offered a tour of the facility, ask for ne and witness firsthand the quality control measures in action. 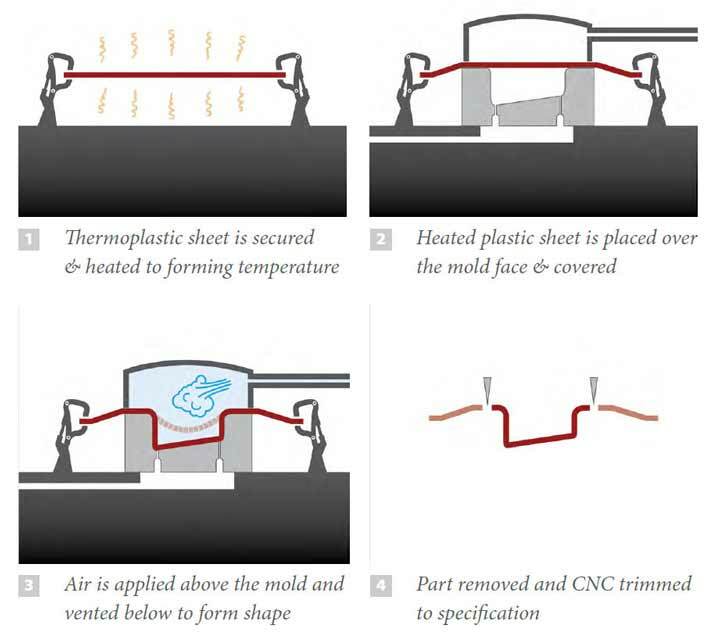 Cleanliness and organization are vital since thermoforming is an “open mold process” meaning airborne dirt could end up as an inclusion in the finished part and become a cosmetic flaw. 3. Does the contract manufacturer utilize efficient manufacturing methodologies and conduct process improvement events, such as Lean Manufacturing and Kaizen events? Lean Manufacturing practices are focused on the removal of inefficient practices in manufacturing, management, and administration operations and part of the methodology is the regular evaluation of current processes with emphasis on continual improvement. Companies that are committed to following Lean Manufacturing techniques often have a very efficient manufacturing operation, state of the art equipment, and produce quality parts with a low rejection rate. 4. Does the thermoforming processor have dedicated engineering experts on staff (in-house) to provide tooling design and construction project management? Properly designed and constructed tooling is the foundation of plastic thermoforming and is essential to producing a high quality consistent product. Poorly engineered tooling can result in part dimension variations, surface abnormalities, and other defects. See 6 Common Thermoforming Quality Issues Actually Caused by Improper Tooling. 5. Does the processor conduct a “Define and Discover” Innovation Engineering approach to seek avenues for collaborative project development and management? This collaboration innovation technique sets the stage for a smooth product development which is more likely to meet performance and delivery expectations. Ultimately, each project is unique. A commodity type part will likely not require the same level of quality in detail and precision as a multi-part medical device assembly. However, finding a reliable custom manufacturer that can produce your parts consistently, efficiently, and to your specification is a paramount factor to the success of any product. Have more questions about the role of quality manufacturing for your parts and components? 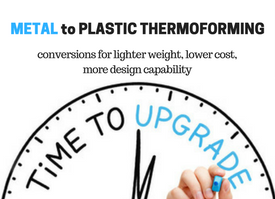 Interested in exploring plastic thermoforming solutions for your OEM product? The manufacturing supply chain can be long and complex. Managing independent suppliers for design, tooling construction, assembly, part painting, and more can be challenging, and each has an influence on the quality, timing, and cost of the finished product. 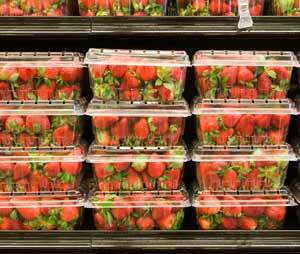 For custom plastic thermoforming, post-production part painting is a key link in this supply chain. That is why Productive Plastics decided to bring our own painting operation under the same roof as our manufacturing facility. Our cutting edge painting and finishing facility is solely dedicated to meeting the surface finishing needs of custom heavy gauge thermoformed parts manufactured by Productive Plastics. If a supply chain is only as strong as its weakest link, then strengthening or removing that link reduces the risk of a break. Consolidating the painting and manufacturing operation at Productive Plastics means that there is one fewer supplier to manage and monitor. In-house facilities and complete control over the painting process reduces or eliminates the logistical and quality control costs associated with an off-site supplier. The painting facility is located a mere 100 feet from the manufacturing floor which means that parts can be painted, cured, and ready for shipping or assembly in the same day that they are manufactured. Incorporating a painting facility into the operation at Productive Plastics allowed us direct control of the painting process and quality management. We implemented the same lean manufacturing techniques, proven processes, and quality controls that we have been evolving on the manufacturing floor for over 6 decades. Strategically consolidating the manufacturing supply chain is just one of the ways Productive Plastics is constantly improving our ability to contribute to your product’s success. Contact us and give us the opportunity to show you how we can provide much more than a high quality plastic part. 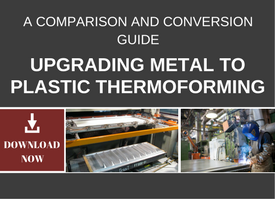 The team at Productive Plastics has put together a new comparison and selection guide for plastic thermoforming and injection molding manufacturing processes. The guide is full of useful information from basic overviews to technical comparison data on each process to assist you in selecting the right manufacturing solution for your project. At the 2018 Plastic Thermoforming Product Development Summit, hosted by Productive Plastics, you will learn about every aspect of developing a new product or converting an existing project to the plastic thermoforming manufacturing process.You will gain insights about the entire development process, from design to finished assembly, as you engage with industry leaders from each link in the production supply chain. 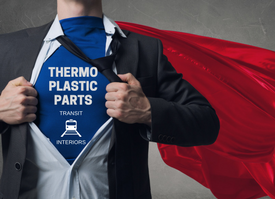 When comparing a part manufactured with the heavy gauge plastic thermoforming process and the injection molding process, next to production volume, the largest factor that can impact the cost and even process feasibility is the size of the part. 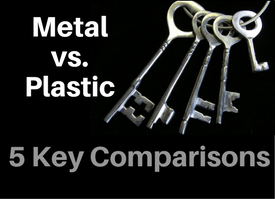 Essentially, the larger the part is, the more expensive it becomes to produce with injection molding. Comparatively, part size has a very minimal cost effect on plastic thermoformed parts. 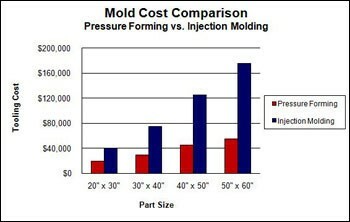 The breakeven point on cost between the two manufacturing processes, with respect to annual production volume (Deciding Between Plastic Thermoforming and Injection Molding – The Choice is Not Always Obvious), increases as part size increases to approximately 5,000 parts or higher depending greatly on how large the part is. Why Does Part Size Affect Cost and Manufacturing Process Selection? The injection molding process requires a very large initial capital investment in the tooling and equipment needed to produce a part. This is because the nature of the process involves a very highly engineered 2-sided mold to create a part by feeding thermoplastic resin into a heated barrel with a rotating screw. 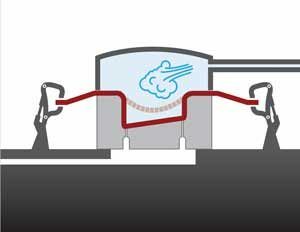 The screw delivers the raw material forward collecting under pressure the amount required to fill the mold cavity and then injecting into the mold at high pressure and velocity. This action requires highly structured molds and equipment capable of withstanding very high clamping pressure. 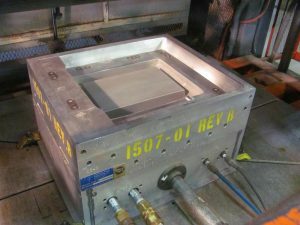 As part size and dimensions increase, the complexity of design, engineering, and calibration required to construct, install, and process this 2-sided mold results in a significant increase in the cost of equipment, tooling and setup. The per-part production cost and lead time may also see an appreciable increase as the part size increases requiring much more robust molds and equipment. These increased capital expenditures will result in greater investment and overhead costs calculated in the piece price. Injection molding machines have a limited total mold size capability but can often accommodate multiple parts within the construction of a mold. Smaller part sizes equate to a higher number of parts manufactured per mold and machinery cycle. Larger part sizes decrease the number of parts that can be manufactured per mold and cycle. Think of a muffin tray with 3-inch diameter muffin molds. Now take that same size tray but with 6 or even 10-inch diameter muffin molds and you imagine the impact on production and cost. In fact, most standard injection molding machines can only accommodate a maximum part size of 4’ x 4’. Larger machinery is available but is also drastically more expensive. The heavy gauge plastic thermoforming process, on the other hand, involves considerably less pressure and most applications only require a single one-sided tool to produce a part. 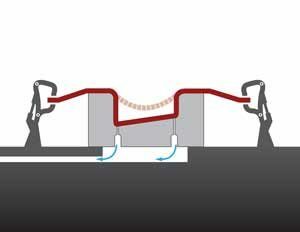 Additionally, only one part is formed per cycle in heavy gauge thermoforming applications. Consequently, the initial tooling investment is drastically reduced. While an increase in part size will still increase the tooling investment, the impact on cost is substantially less when compared to injection molding. Heavy gauge thermoforming equipment has oven zoning and variable sheet size capabilities which allow for a wide range of part sizes to be efficiently formed from the same equipment investment. The nature of the thermoforming process and flexible capacity capabilities makes scaling production for larger part sizes a relatively easy process. 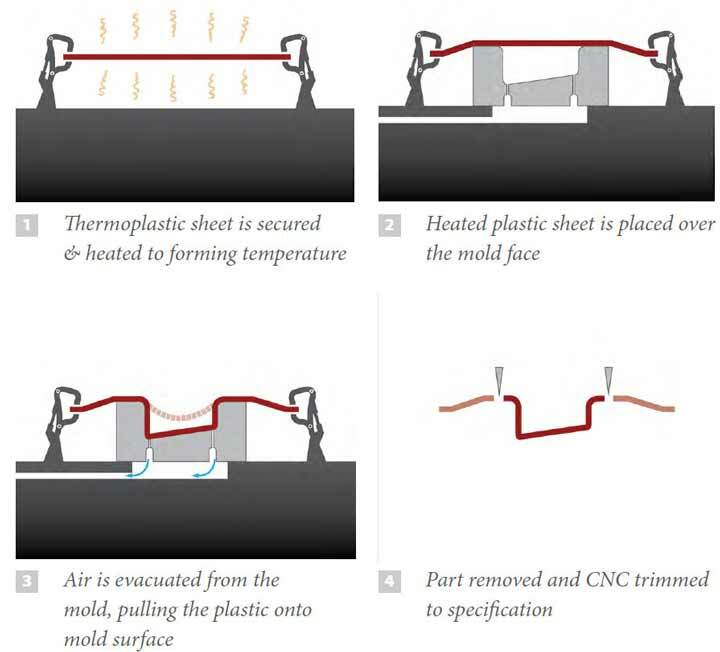 Since most heavy gauge thermoforming operations utilize cell-based manufacturing and CNC part trimming, a larger part can be produced with little impact, other than increased material, on per part cost, cycle time, and lead time. Thermoforming machinery can also manufacture part sizes as large as 10’ x 18’ providing a much larger part size capacity than injection molding.